Samsung has announced that mass production of the industry's first 512GB embedded Universal Flash Storage (eUFS) 3.0 chips has begun. 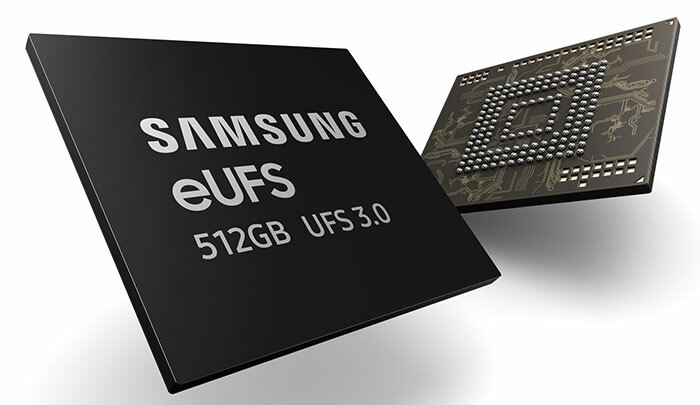 The eUFS 3.0 standard components will deliver "twice the speed of the previous eUFS storage (eUFS 2.1)" according to Samsung. Furthermore, it plans to expand its offerings to include a 1TB eUFS 3.0 component later in the year. The new Samsung 512GB eUFS 3.0 part is created by stacking eight of the company's fifth-generation 512Gb V-NAND dies and integrating a high-performance controller. A blazingly fast 2,100MB/s Sequential Read Speed is touted for the new storage, which is more than twice as fast as Samsung's current best 1TB eUFS 2.1 components. Read speeds of 410MB/s are over one and a half times faster than that same predecessor. Turning to IOPS performance, the new memory component provides up to a 36 per cent increase over the current eUFS 2.1 industry specification, at 63,000 and 68,000 IOPS, respectively. In terms of everyday mobile performance users should benefit from increased responsiveness and data transfer speeds. With devices packing in more cameras and megapixels for 4K video, HDR, 360-degree films etc, this faster built-in storage could come in handy. In comparison to a standard PC SATA SSD Samsung says the 512GB eUFS 3.0 storage offers 4x faster read speed - or it is 20x faster than a typical microSD card. Theoretically the new storage facilitates the transfer of a 3.7GB movie file in a little over three seconds. "Beginning mass production of our eUFS 3.0 lineup gives us a great advantage in the next-generation mobile market to which we are bringing a memory read speed that was before only available on ultra-slim laptops," highlighted Cheol Choi, executive vice president of Memory Sales & Marketing at Samsung Electronics. Choi pointed out that Samsung will be mass producing 1TB eUFS 3.0 chips in H2 this year. On the topic of other variants, Samsung will also launch a 128GB eUFS 3.0 alongside the 512GB part later this month. Then the 1TB and 256GB models will arrive in H2. I read about this like 3 or more months ago, its good to see progress and speed increases. But, when will this be used in phones is what I wonder. Its not really relevant for the phones. I don't know which storage type i got in my phone but it is fast enough. And the phone have few years on the market already. Its good to see progress in storage speed all around. As the S10 is available shortly with 1tb I imagine it will be in that…. They better find a way to fill up all that space, maybe they could add more cameras?